I've been enjoying rhubarb for almost 3 months, but this week we're supposed to hit 101F! My beloved rhubarb patch does not like hot weather and will probably begin to wilt and die. Can't complain, this year I've had my best rhubarb season yet! Victoria is a rhubarb that can be started by seed, the perfect solution for growing it as an annual, here in Arizona. I purchased my Victoria rhubarb seeds from John Scheepers Kitchen Garden Seeds 4 years ago, and the seeds have provided me with 4 seasons of rhubarb, with 100% germination. Pretty good, huh! I began my plants inside, last August and planted them outside in October, when the weather finally cooled down outside. Planting rhubarb in the fall gives it a head start to establish a strong root system. You won't actually begin harvesting until the following spring. Rhubarb seeds need to soak overnight, before planting in a light seed starter soil. Once the seeds germinate you'll need to keep them under a fluorescent light about 2-inches above the tiny plants. In about 6 weeks they are ready to be planted outside, so plan accordingly, aiming for the 2nd week in October, if you live in the desert. Next year I'm planning on expanding my patch. Rhubarb does best in well mulched soil with lots of manure. Hoping to prolong the delicious flavor of rhubarb . . . 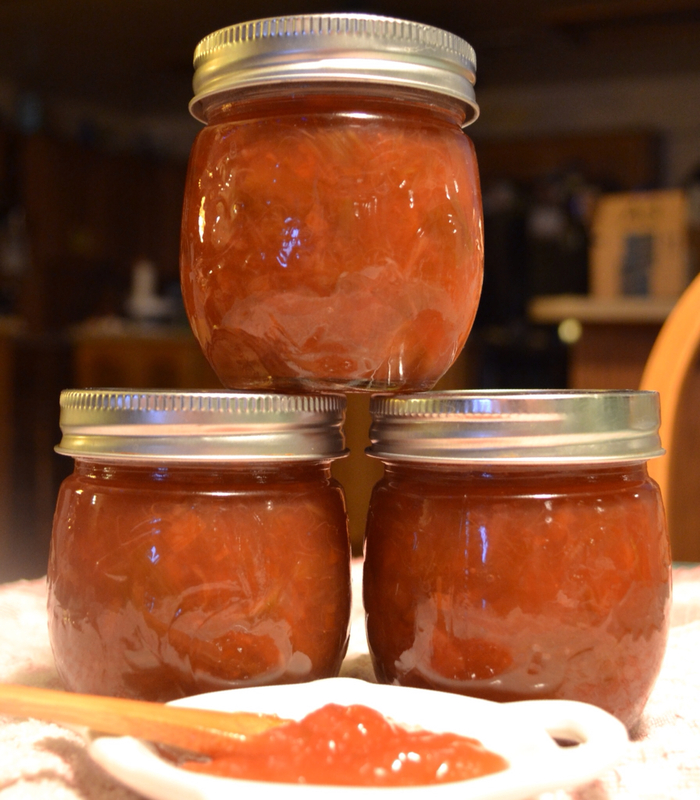 I decided to make some rhubarb jam! My recipe was adapted, from an adaptation by Alice Waters! Red food coloring, optional (my rhubarb was green, and needed a wee bit of help). 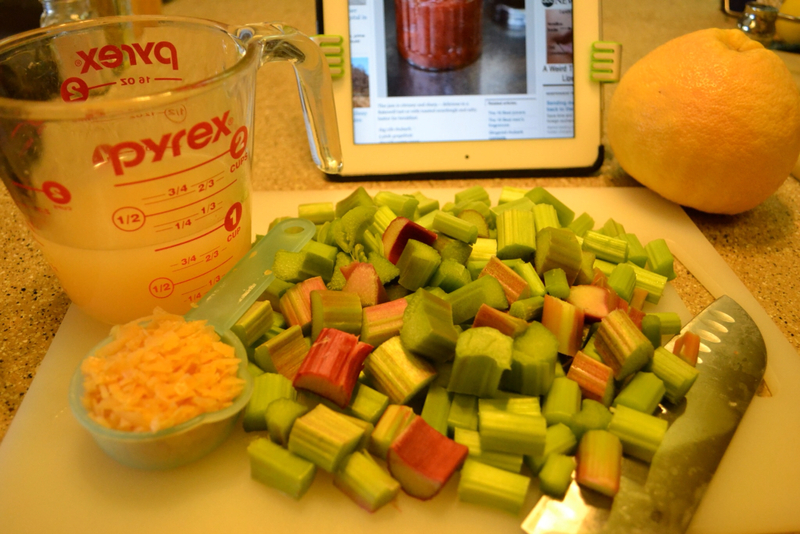 Wash and chop rhubarb stalks into 1-inch pieces. 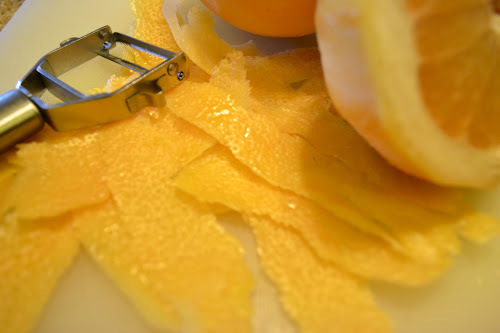 Wash grapefruit, and peel grapefruit zest using a potato peeler; chop finely. Juice 1 cup of fresh grapefruit juice. Combine: Chopped rhubarb, grapefruit zest, grapefruit juice, and sugar in a glass bowl. Cover bowl with parchment paper and let it macerate overnight on the counter. Pour rhubarb into a stainless steel pot that is wider than it is deep. Simmer rhubarb for 15 minutes, stirring often. Sprinkle 1 1/2 teaspoons of Ball's Real Fruit Pectin over the rhubarb. 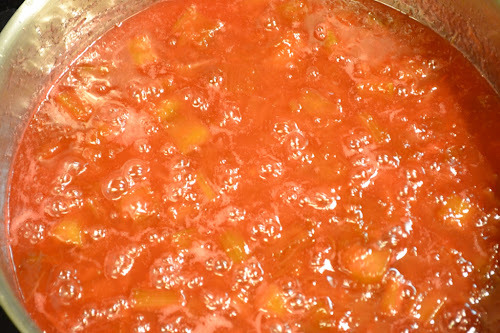 Stir to thoroughly to dissolve pectin and continue cooking for another 5 minutes. Fill 8 ounce sterilized jars to the bottom ring, adjust lids and process in a hot water bath for 15 minutes. Jam will keep in the refrigerator for 3 weeks if you choose to not can it. Use a potato peeler to remove the grapefruit zest. Juice grapefruit, finely chop grapefruit zest, chop rhubarb. Simmer rhubarb for 15 minutes before adding the pectin. The finished prooduct! Rhubarb Jam . . . Tart, with a touch of sweet . . . Perfection! This jam is amazing! The grapefruit juice and zest enhance the robust rhubarb flavor. It's the perfect way to preserve my favorite taste of Spring . . . Over at Julie's!!! Fresh Rhubarb Pie . . . Oh Yah, Baby!! !